My son, who is on the autism spectrum, was very anxious about having his eyes dilated for his annual vision test. 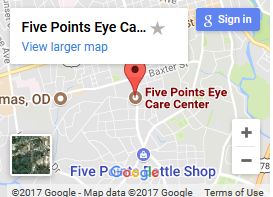 The staff at Five Points Eye Care Center were so patient and reassuring with him. Dr. Brya even gave him part of his eye exam with them both stretched out on the floor! Then she gave him a “prescription” for ice cream at Hodgson’s Pharmacy! So glad to have such an exemplary business as part of our community!